Dyson is renowned as much for its inventions as the way it makes them—a process The New Yorker once described as "a second industrial revolution." That's why the James Dyson Foundation was created: To foster and promote young inventors. Today, the organization announced the national winner of its annual Dyson Award, and Gizmodo chatted with the inventor to find out more. The finalists in this years award, which we wrote about a few weeks ago, ranged from a marker that tells you when your sunscreen has worn off to a pneumatic pack that helps rotate immobile patients. The idea that won out comes from Yen Le Loftin, a young industrial designer who created a folding cart, Uplift, while in school at the University of Houston. Loftin is interested in what she calls transgenerational design—or as she describes it, design that can be used by every age group. Her idea was to focus on food, and how we obtain it as we age. According to Loftin, that's an incredibly important marker in how we remain independent as we age. "As long as I'm able to feed myself—I feel that I've maintained my independence," she explains. By shadowing an elderly friend while she shopped, Loftin realized that her target user didn't need as much help in the grocery store or her home, but in the space between, the loading and unloading from the car. "That's when I noticed her slowing down," says Loftin. "This was when she told me she has to stop and take a break." This is what Loftin calls a "latent need," or a need that users themselves might not even realize they have. So she set her sights on easing the process of lifting groceries to and from a cart, and then to and from the fridge. Over the course of 30 prototypes, she verged closer to a mechanism that would bridge the gap between cart and truck—in the end, it was by looking at the legs on a common stretcher that she arrived at the solution. Uplift's cart swings on hinges, which allows the user to "push" it into the trunk. Then the user lifts up the rest of the cart using a handle between a second set of hinges—and it slides into the compartment with the cart. 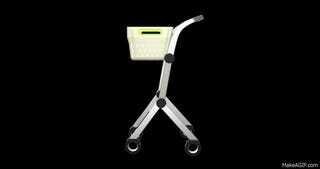 So a mechanism originally designed to help EMT workers lift patients into ambulances ended up inspiring a similar device that leverages the weight of groceries against the rest of the device itself. Loftin says she hopes the Dyson prize money will help her connect with investors and experts who can help her create a working prototype—but first, a patent. Check out the rest of the finalists here.